Home » Gaming » Assassins Creed Origins DLC Details Are Here! Assassins Creed Origins DLC Details Are Here! Author’s Note: This article will contain some spoilers for the end events of Assassins Creed Origins. Remember what Al Mualim said: “He who increaseth knowledge, increaseth sorrow”. Assassins Creed Origins has been out for almost one month now, and many of us may have already beaten the main story line by now. That being said, if you play the Assassins Creed series of games as fervently as I do, you may have heard that Ubisoft has already planned releases for some interesting DLC expansions. These expansions will be coming out during the first quarter of 2018, and from what we can tell, they’re going to be almost as epic as the full game itself. Players who went the route of getting the Gold Edition game (like I did) will get these expansions for free, as the Gold Edition includes the ubiquitous ‘Season Pass’; a gimmick which Ubisoft has been using for many of their titles. First up, players will be able to get their hands on an expansion called ‘The Hidden Ones’, which will be available in January of 2018. The Hidden Ones is said to take place several years` following the events of the main game, and will see Bayek of Siwa travel to the Sinai Peninsula. There, he will become embroiled in a harsh conflict between the Roman forces who occupy the area, and the rebel faction who fight for their autonomy. 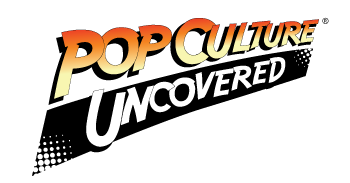 As the title of the DLC indicates, the story will also explore the history of The Hidden Ones, which was the original name for the Assassin Brotherhood following its formal founding by Bayek and Aya/Amunet. Where Bayek’s journey will take him, and what he will uncover is still a mystery to gamers, although the tone of the DLC announcement almost makes it feel as though this will be a lot of exposition with some good stealth elements. Second, we have a DLC called ‘The Curse of the Pharoahs’, coming out in March of 2018. Frankly, I am probably more excited for this one, as what Bayek discovers in his travels to Thebes and the Valley of the Kings is described as “a living nightmare”. The story in this expansion is also said to delve further into Egyptian mythology, as it will see Bayek face off against not only some mythical beasts, but dead pharaohs as well. If you’re into the seriously in-your-face combat of Assassins Creed Origins, then it feels like The Curse of the Pharoahs will appeal to you. 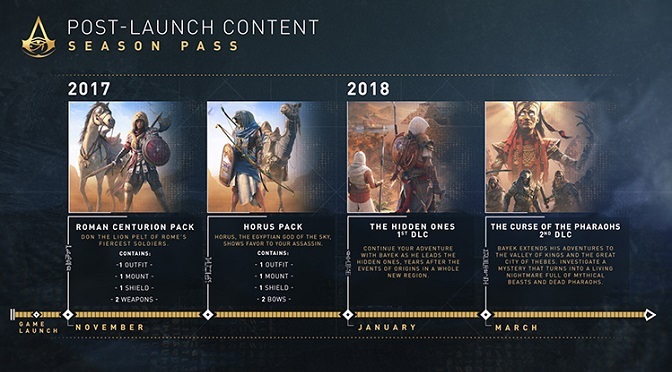 As Ubisoft is occasionally wont to do, some item packs that were once only available to purchasers of special editions or Season Passes have also become available to all Assassins Creed Origins players. As of this month, players of the game are able to download & purchase the Horus pack, and the Roman Centurion pack. These packs each contain a new outfit for Bayek, as well as a special mount, and some unique weapons (I’ve been riding around with the Horus pack, since it looks so cool). Finally, gamers will see what Ubisoft is calling ‘Discovery Tour’. This is, essentially, a new mode to the game, which will give players the ability to ride, walk, run, climb, and swim through all the areas of Egypt – without combat, story, or time limits. The mode will provide “dozens of interactive tours” through the various areas of ancient Egypt, each one curated by actual Egyptologists and historians (don’t you love when a game developer does their homework??). According to Jean Guesdon, creative director for Assassins Creed Origins, the company has actually had teachers, institutions, and other educators approach them to ask about doing this sort of content to one of their games. Discovery Tour is also slated for early 2018, and will be added as a free update to the game for all players. There you go, dear readers! All of the currently-announced DLC for Assassins Creed Origins! According to game director Ashraf Ismail, Ubisoft has more content planned, but I suppose that we’ll just have to wait & see what the future holds.